You are at:Home»Hunting»2018 Broadhead Challenge – What is the Best Broadhead for 2018? With so many broadheads on the market, how can we decide which is the best to use for a quick lethal kill? 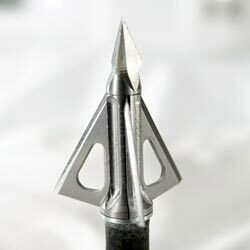 While a properly tuned bow and a well placed shot is paramount, the broadhead’s design can influence how well we dispatch an animal. Factors such as tip design, blade angle, blade sharpness, aerodynamic correction ability, and cutting diameter are just a few factors that can set one broadhead apart from the others. 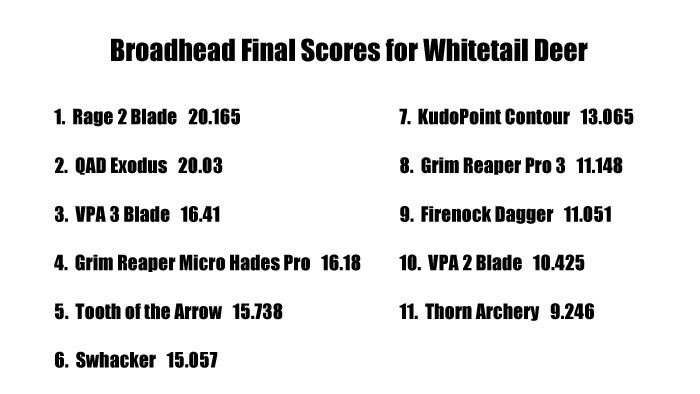 In this broadhead challenge, we conducted various tests to see which heads performed the best in individual categories. The characteristics tested were also voted on by the general bowhunting public to determine how much weight each category would receive in the overall score. So, buckle up and enjoy our tests that we conducted in our search for the best broadhead of 2018. We would like to give thanks to the Joliet Archery Club for allowing us to set up all of our equipment and allowing us to conduct our tests. 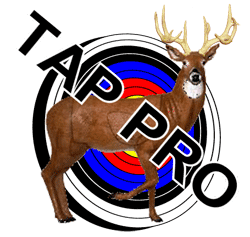 Check them out, one of the best archery clubs in the country! At the beginning of the year, we approached every broadhead manufacturer we could think of. Although most of the companies seemed enthused to be part of our test, only 11 heads were sent in for testing. Therefore, the results of this test will determine the best heads of the 11 per our testing procedures. 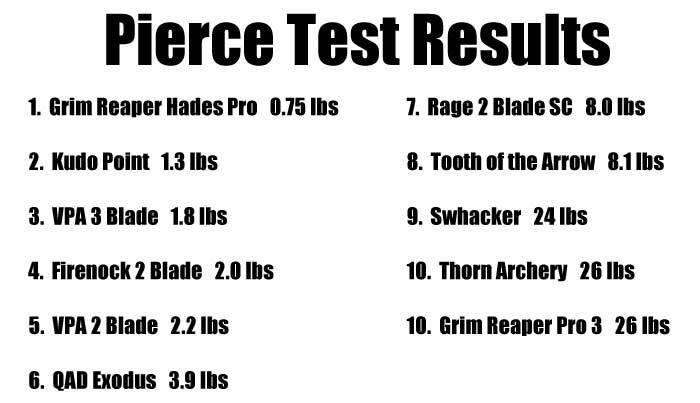 All broadheads tested were 100 grains in weight. 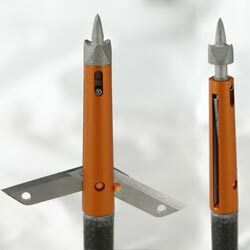 Let’s take a look at the broadheads. 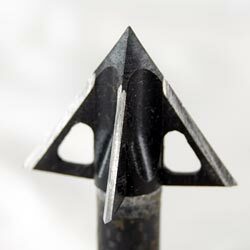 The QAD Exodus broadhead is an American made head that is tough, tough, tough. It posses a super sharp bone splitting tip along with some of the sharpest blades of the group. 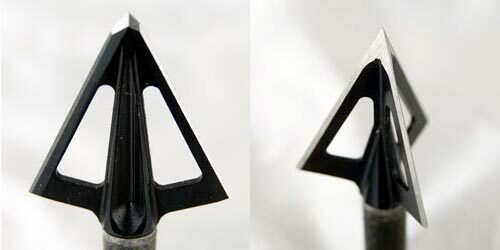 One unique feature of this broadhead is that it partially seats recessed over the tip of the arrow shaft which leaves its tip about the same distance from the insert as a field point. This keeps the dynamic spine very close to the dynamic spine of the arrow with a field point installed. Overall a very nice design. For more information visit https://www.qadinc.com. 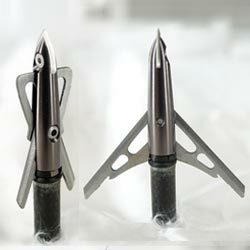 The Firenock Dagger broadhead is an interesting head from one of the brightest minds in the archery industry. It’s unique inside curves create a vortex at high speeds which turns the blood into a dense foam which results in coagulation stopping the animal’s ability to breathe. This bronchial tube blockage leaves the animal in a panic which will freeze the animal which allegedly results in recovery after a very short distance. The designer of the head suggests using bows that shoot arrows over 330 FPS in combination with aerovane fletchings for the ultimate results. These 0.124″ thick heads deliver a 1-1/16″ cut which when combined with it’s unique coagulation properties should produce interesting results in the field. For more information visit https://www.firenock.com. The Grim Reaper Pro 3 broadhead is a front deploying mechanical head that delivers a 1-3/8″ cut. The Pro 3 features 40 degree swept blades that are recessed in flight behind the new PRO TIP, which is one of the sharpest tips of the broadhead challenge. The 3 0.035 stainless mechanical blades are retained in flight thanks to the “Snap Cup” which allegedly allow the blade to deploy smoothly on contact. 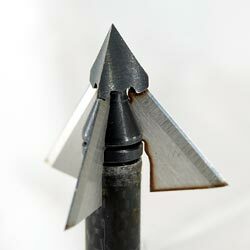 Aerodynamic correction should be great on this broadhead, but how will it perform on the penetration and pierce test? We will see! 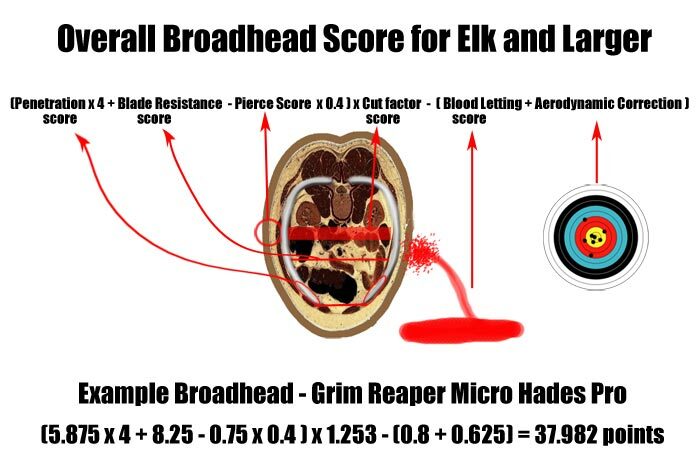 For more information visit https://www.grimreaperbroadheads.com. The Grim Reaper Micro Hades Pro is a 3 blade fixed broadhead that delivers 1-1/16″ diameter cut. This little powerhouse includes the needle/razor sharp v-notched trocar steel tip which allows for effortless penetration so the 0.035″ MAXX EDGE SS blades can get to work. It’s compact design along with its strategic blade angle should allow this head to fly like a field point and do some serious damage while passing through any animal. For more information visit https://www.grimreaperbroadheads.com. 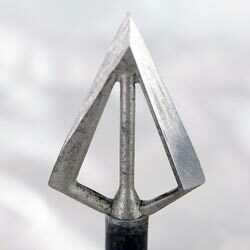 The Kudo Point is an American made broadhead that really delivers on sharpness. These heads are precision manufactured with a special factory edge treatment that leaves them as probably the sharpest heads in the broadhead challenge. The heads are meticulously segregated into lots that only allow a 0.2 grain variance leaving the customer with precisely matched head weights. These 100% stainless steel heads are 0.050″ thick, have a dark matte finish to reduce glare, and have a lifetime guarantee. The Kudo Point broadheads boast excellent edge retention which should allow customers to harvest multiple animals with the same head. For more information, visit https://www.kudupoint.com/. And here it is, the Rage 2 Blade. Never before has a broadhead be the target of so much praise or criticism. The “king of mechanical broadheads” is 5/8″ in diameter in flight and then, after deployment, delivers a devastating 2 inch cut. It’s 0.039″ cut on contact tip, along with its tough 0.035″ stainless steel main blades, aids in bloodletting by inducing an impact of a 4 blade head. This slip cam (SC) mechanical utilizes a SHOCK collar which holds the blades in place during flight but allow deployment upon impact. Like most mechanicals, they should perform well in our aerodynamic correction test, but how will they do in the penetration test? For more information, visit https://www.feradyne.com. The Swhacker broadhead is right up there with the Rage as far as popularity with mechanical broadhead users. 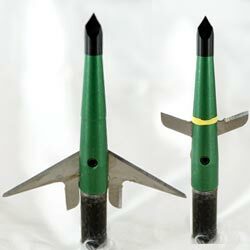 The Swhacker is a front deploying broadhead that releases its blades after penetration. The exposed inflight “wing blades” are the 1″ wide and are made from 0.031″ thick stainless steel. While punching through hide and ribs, the wing blades act as the deploying mechanism for the 2″ diameter main blades. The ferrule is 2 inches long and is made of 2024-T4 Aluminum. We know the Swhacker and perform well on a steel drum, but how will it do on our test? For more information visit https://www.swhacker.com. 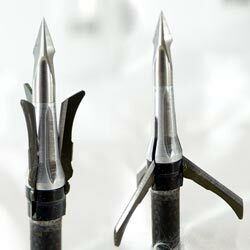 Thorn Archery mechanical heads are an interesting newcomer on the broadhead market. These mechanical heads have literally zero blades exposed during flight which should allow them to fly exactly like a field point. Upon impact the “rip-tip” absorbs shock and is pushed back into the ferrule and cuts the sheer pin which is used to contain the blades during flight. After the sheer pin is, well, sheared, the main blades deploy and should leave an advertised 1-3/4″ diameter cut. We are really interested in seeing how these heads perform. For more information visit https://thornarchery.com/. The Tooth of the Arrow fixed four blade broadhead is an American made broadhead that is machined from one solid bar of steel. This little powerhouse delivers a 1 inch diameter cut with its four blades that are comprised of 11L41 steel. This aerodynamic head is hardened to Rc45 and has a black oxide plating. It’s chisel tip along with its low profile design should make it fair well in a couple of the tests that we are going to perform. For more information on this broadhead visit https://www.toothofthearrowbroadheads.com. 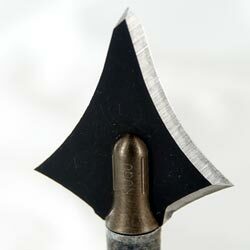 Vantage Point Archery (VPA) is the maker of this American made high carbon steel 2 blade head. The 1.9″ long VPA 2 Blade is CNC machined from a solid piece of high carbon steel and gets heat treated to 55 Rockwell. This 2 blade head features a double tanto style tip for durability shot after shot. It’s vented blades are 0.050″ thick and deliver a 1-1/8″ diameter cut. This quality head is easily resharpened and should fare quite well in a few of our tests. The VPA 3 Blade features the same material specs as the VPA 2 blade broadhead but in a 3 blade version. 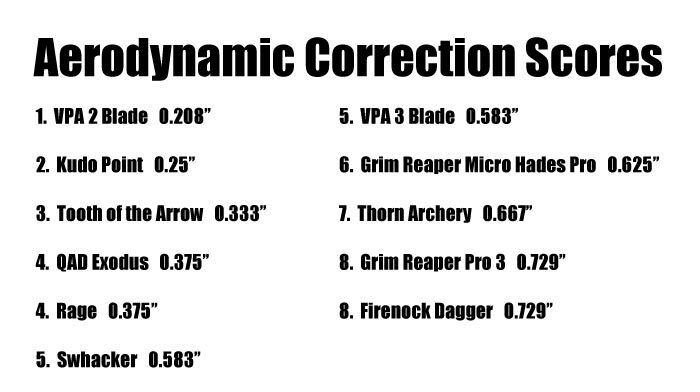 The nice thing about VPA broadheads, in addition to their high quality construction, is the fact that they are available in many different weights for the archer that wants to shoot a higher FOC for increased penetration. 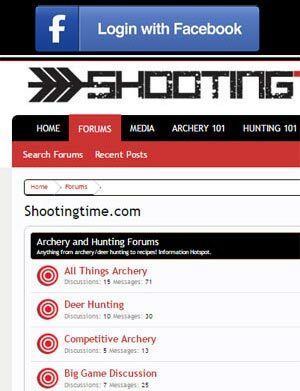 For more information visit https://vparchery.com. 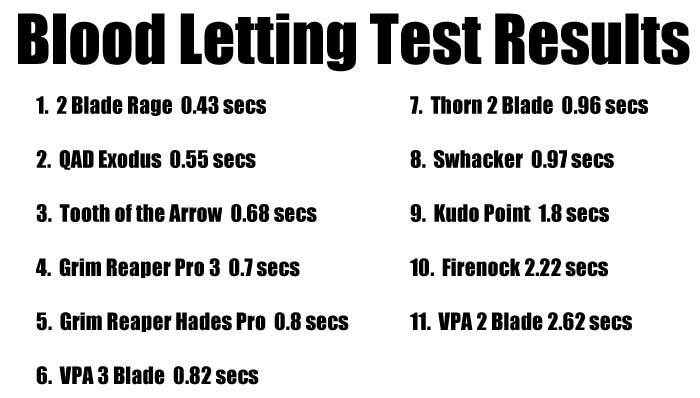 Here are the tests that we conducted to determine which broadheads perform the best. 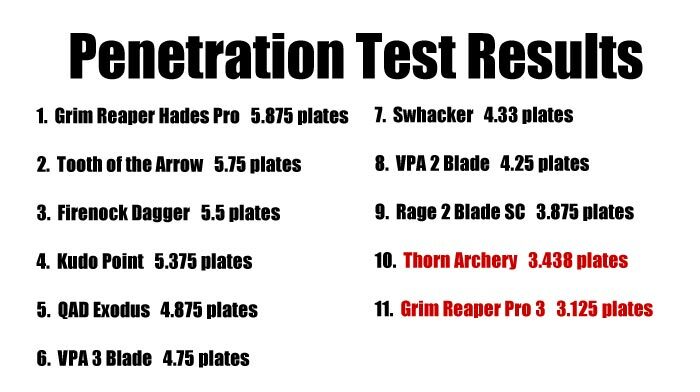 Keep in mind that these tests are not perfect but should give an overall conclusion on how well the broadheads could perform in a hunting situation. Here’s is how we set up our equipment to guarantee human error was not involved in any of the tests. If you have any comments, suggestions, or criticisms, let us know! Enjoy. This bloodletting test was conducted to see how much the entry and exit wounds of each broadhead affected the flow of liquid. Each head was pierced through a sheet of thick mil plastic and then the flow rate of water through those holes was recorded. The results will give you an indication of how well the broadheads open flaps of hide and impede the flow of blood. As you can see, the 3 and 4 blades performed the best. Wait, the Rage is only a 2 blade head right? Not with the cut on contact tip. With the cut on contact tip and the generous 2 inch main blade cut performs like a 4 blade and took the top position of this challenge. The pierce test was performed to see how well each head could pierce through an animal’s hide. In the test, we lower a tight fabric down onto the broadhead and record the amount of pounds needed for the broadhead to pierce completely through. We feel this is a strong indication of how much energy each broadhead would need to initially enter the animal. The fabric used was 100% polyester fabric. The results of this test were very interesting. You can clearly see how the tip design, blade angle design, blade sharpness and whether the broadhead was mechanical or fixed impacted the scores. This test was conducted to see how each head would react in an improper flight situation… or whether or not it truly flew like a broadhead. Depending on how well it’s tuned, every bow induces an amount of fishtailing or porpoising into an arrow. The broadheads overall design (blade surface area, broadhead length, etc.) impacts how quickly the broadhead allows the fletchings to stabilize it’s flight pattern. In this test, we purposely untuned a bow to induce a right tear into the arrow’s flight. After untuning the bow, we resighted our test bow (Prime Logic) so that field points were hitting the bullseye. Next, we shot each broadhead at 10 yards and recorded how far off the bullseye the broadheads impacted. We believe these recordings accurately indicate how well each broadhead resist the fletching’s ability to stabilize the arrow. In our opinion, here is the king of all the tests. Penetration due to broadhead design has always been a hot topic on social media. Different animals and shot placements produce a variety of resistance to arrow penetration so how could we effectively test this? With a plate test. For the penetration test, we used our Coop’s Bowsmith Pro and dialed it in so our bare shaft arrows were creating a perfect rip at 12 feet. Knowing our arrow flight was close to perfect, we then shot each broadhead into a series of luan plywood plates (0.20″ thick) that were spaced 1.5 inches apart from each other. These plates now have created a “football field” in which we could see what “yardage marker” our arrows penetrated to. The following video has some slow motion footage, plate penetration breakdowns, and an explanation of why we feel our testing procedure wasn’t perfect. Have a watch. ** After watching this video, we realized that we anticipated seeing more rotation out of the Firenock Dagger. In hindsight, the Dagger only went through about an 1-1/8″ of solid material therefore the rotation wasn’t more evident. 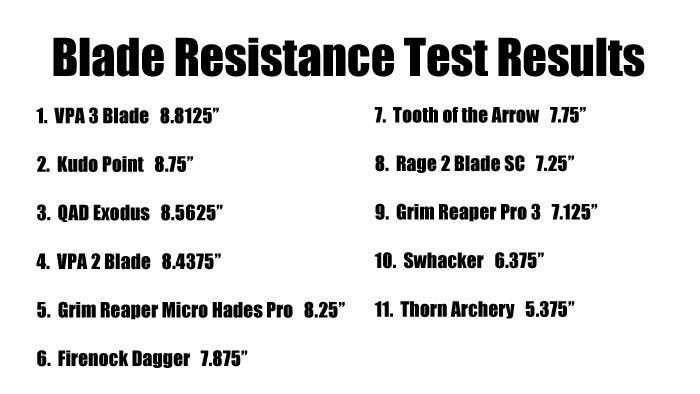 The blade resistance test is a simple test to see how much drag each broadhead and it’s blades had while being shot into a Rinehart block style target. Rinehart targets use a foam that is super consistent which lets shot after shot penetrate exactly the same amount. The only different factor in this test is the design of each individual broadhead. After each shot, we took a silver sharpie marker and made a penetration mark. After pulling each arrow, we measured from the tip of the broadhead to the penetration mark and recorded the number. This is the broadhead’s score. 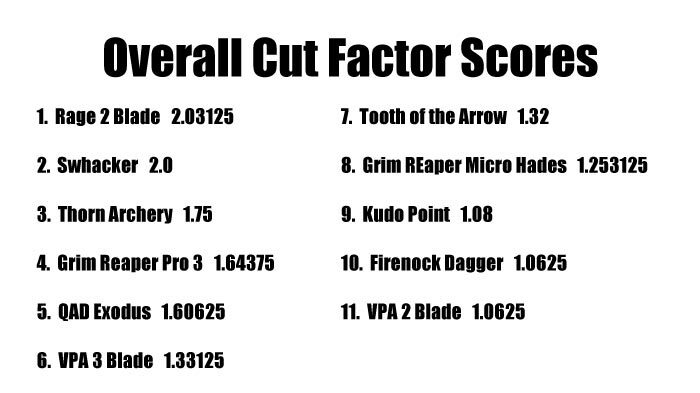 The cutting diameter of the broadheads is figured in to the final results of our broadhead challenge. When an arrow is passing through the vitals of an animal, an extra 1/4 inch of cut may be the difference between clipping the heart or lungs versus just missing. Since 2, 3, and 4 blade heads differ in blade distribution, we adjusted scores accordingly by using our unique formulas. In our formulas, we used 0.300″ as the average arrow diameter. Have a look at the results. Here are the results of our challenge. There are two sets of results; one set for whitetail deer and one set for elk and larger animals. We considered every obstacle an arrow would encounter while making its journey through the animal. Broadheads were tested for potential bone penetration, hide piercing, blade resistance through internal organs, bloodletting and overall cut factor. Results are based off the use of a bow that delivers equal or superior kinetic energy and/or momentum of the Prime Logic that we used in our testing. 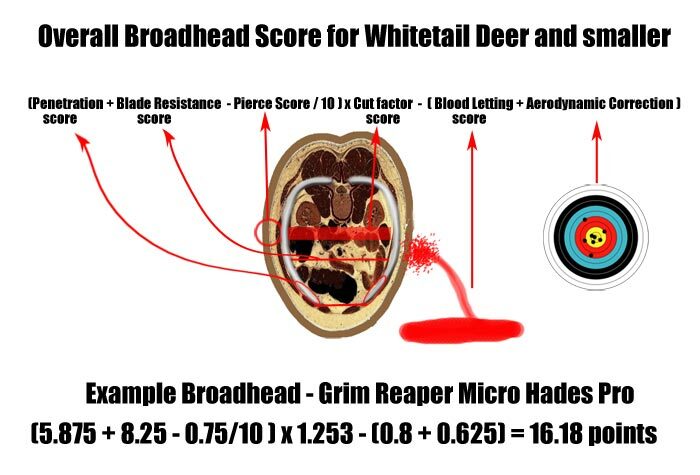 For the whitetail deer scores we used the following formula to rate each broadhead in a 20 yard hunting situation with the deer broadside or quartering away. Results should be accurate for any tuned bow that shoots a well spined arrow, has an equal or superior momentum rating as our Prime Logic and can hit a 6 inch diameter area at the vitals from 20 yards. 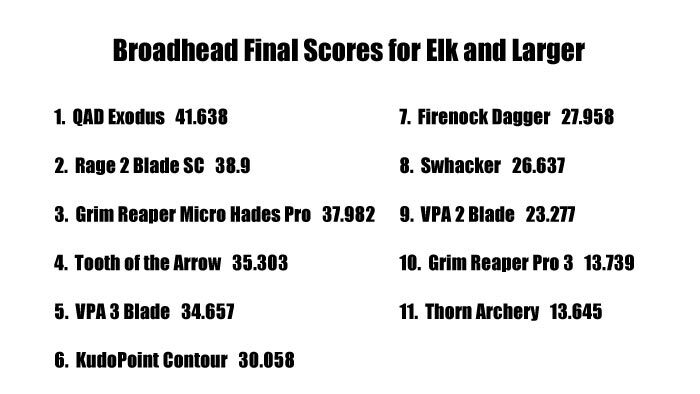 For the elk and larger game scores, we used the following formula to rate each broadhead in a 20 yard hunting situation with the elk broadside or quartering away. Additional weight was added to the penetration scores (x4) and the pierce scores (x4) due to the tougher resistance of the larger animal(s) and the increased range of potential shots. Results should be accurate for any tuned bow that shoots a well spined arrow, has an equal or superior momentum rating as our Prime Logic and can hit a 6 inch diameter area at the vitals at 20 yards.